Message Board: I have created a message board for anyone interested in asking questions about the MGCD or sharing their Dreamcast compatibility experiences. 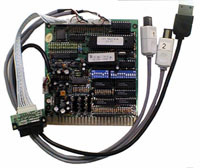 MGCD: The MGCD is a board that allows a Dreamcast to be used in a JAMMA compliant arcade cabinet. There is an arcade gun and a steering wheel that may also be adapted to the cabinet. More detailed information and a game list may be found at the Frolicker Electronic Company website. Getting the damned thing to work: It doesn't seem to be plug-n-play. If you are not familiar with the JAMMA standard or wiring diagrams you may have the same problem I did. The MGCD board diagram has pins 27/28 reserved for dreamcast buttons 6 and 7. On the other hand, the JAMMA pinout specifically uses these for grounds... possibly the coin mech and button grounds on your machine. This means that unless you modify your harness you will probably be unable to get your coin mech or your buttons to work. The easiest work around is to cut wires 27/28 from the harness, ground the buttons and coin mech somewhere else and wire buttons 6/7 if need be (otherwise just tape them off). If you have this problem but that explanation doesn't make sense, email me for more help. Modes of play: It supports "coin for credit" type of play and also "coin for time". If you use the "coin for time" mode, it doesn't seem to care what your game selection dip switches are set to. This mode is good for playing an emulator, Smash Pack... or other games unsupported by the MGCD. The "coin for credit" mode will require a supported game, I suppose this would be best if you want to use one of these to make money. I usually just put the dip switches on the 256 minutes per coin mode so that I can just play and not worry about coining the damned thing up. What works and what doesn't: The dreamcast controllers may be used in place of the arcade controllers if so desired. The dreamcast light gun works as well, but the Arcade gun is definitely much cooler. I was unable to get the Coleco Vision emulator to work (ColEm). SMEG (SMS emulator) works like a charm. The Genesis emulator I've been using has a monitor sync problem on the ROM select screen. I have to readjust it to even select a rom and then adjust it back to play. I've been unable to burn a good copy of an arcade emulator (2 DreamPac coasters and downloaded MameDC 3 times). Gun games don't like to boot if the gun is plugged in and the dip switches aren't set to a gun game. The smash pack doesn't let you select the games that are between the ones on the side and top.